Screenwriter Mark Bomback used real-life events to create the screenplay for "Godsend," a new film about cloning. In the film, Paul Duncan (Greg Kinnear) and his wife, Jessie (Rebecca Romijn-Stamos), agree to let a geneticist named Dr. Richard Wells (Robert De Niro) clone their eight-year-old son, Adam (Cameron Bright), shortly after the boy dies in an accident. Conflict ensues when the newly cloned Adam begins to have nightmarish visions and behaves erratically. 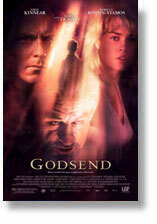 Mark Bomback based the screenplay for "Godsend" on his experience of becoming a father. "I first came up with the idea about the time my wife was pregnant with our son," says Bomback. "[My wife and I]…needed a little bit of [fertility] help …and we were amazed by how far science has come in the past 20 years," Bomback adds. "Godsend" brings the science of fertility and cloning to life by showing what happens when a woman undergoes in-vitro fertilization with DNA from her dead son. This woman is depicted as the character, Jessie Duncan, who is played by Actress Rebecca Romijn-Stamos in the film. Screenwriter Mark Bomback says, "Rebecca was really great about reminding me that…[Jessie] is a woman who's lost her child and, even though she gets that child back through [Dr. Richard] Wells' cloning, she's a woman who has suffered a unique and awful sort of trauma." Just as Rebecca Romijn-Stamos shows the psychological drama of bringing her son back to life through cloning, so too does Actor Robert De Niro show the physical drama of cloning. "It's remarkable to see how he [De Niro] approaches the character [Dr. Richard Wells] and tries to inhabit what it means to be a fertility doctor," says Bomback. "…he asked me for tons of research material and I sent him dozens and dozens of pieces." Director Nick Hamm describes Actor Greg Kinnear's portrayal of Paul Duncan, the character who investigates De Niro's character, Dr. Richard Wells, as being convincing and something audiences can relate to. Kinnear says, "I pretty much had to go to the most horrible place in my own humanity scale to imagine what this couple [Paul and Jessie Duncan] had gone through and how they've suffered." The focus of Paul and Jessie's suffering is their son, Adam, who is played by Cameron Bright, a nine-year-old actor. In "Godsend," Bright must embody the physical and psychological tension of Adam in order to convince audiences that the cloning of a dead boy could indeed be possible. Producer Marc Butan says he used the casting process to ensure that Bright would interact well with the actors playing his on-screen parents in "Godsend"--Greg Kinnear and Rebecca Romijn-Stamos. "We wanted to see them together, to see if there's a natural believability that they are a family," says Butan. "They had a real chemistry together." This chemistry and believability can also be attributed to the character-oriented screenplay written by Mark Bomback. Director Nick Hamm sums up the realistic character development used in the screenplay by saying, "The combination of psychological realism of the parents' grief and the opportunism of a brilliant scientist combine to make the dramatic choices and implications of our film truly horrific." So, when audiences see "Godsend" in theaters, they will witness the horrors that can result from using the God-like power of cloning. Casting By: Sarah Halley Finn, C.S.A; Randi Hiller, C.S.A.